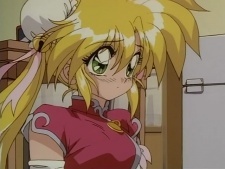 Suzuka (Fawn Bell) is Tsukikage's (Moon Shadow) girlfriend. She is happy, carefree and enjoys to have "fun" indoor and outdoor in the public with Tsukikage and teasing the other ninjas. Both Suzuke and Tsukikage are bored of the life as a ninja and their dream is to live in an appartment in the city and live a normal life. As the result of several "shameles acts". Lady Youga, the leader of the ninja village, banish both Suzuka and Tsukikage from the village. And so, their dream in the city can begin. Suzuke is a Ninja. And she show skills in the arts of escape techniques. From smoke screens to transfiguration spells to create a decoy for an escape and confusion for her opponents. Her rival is Sagari(Morning Mist) who is after to steal Tsukikage from her. She will protect Tsukikage above all else.